Hybanthus verticillatus (Ortega ) Baill. Stems: Erect or ascending, several clustered in small tuft, simple or branched, leafy. Leaves: Opposite below to mostly alternate above, simple, sessile, linear to linear-lanceolate, .5 to 1.5 inches long, less than .5 inch wide, glabrous; margins mostly entire; tips pointed; smaller leaves often clustered in axils; stipules leaf-like, .5 to 1.5 inch long. Inflorescences: Solitary flowers, in leaf axils, short-stalked, nodding. Flowers: Sepals 5, ovate to lanceolate, margins usually fringed with hairs, tips pointed; corollas less than 1/4 inch long, 5-petaled, greenish white to cream-colored; tips purplish; lower petal fiddle-shaped, swollen at base, bearded within, larger than 4 upper petals; stamens 5, short. Fruits: Capsules, egg-shaped to nearly spherical, glabrous; seeds rounded, slightly flattened, shiny black. Habitat: Dry, upland prairies, hillsides, rocky areas, and disturbed sites, on gravelly or sandy soils. 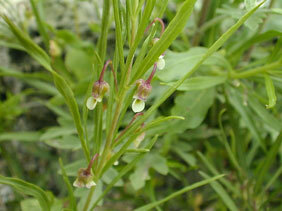 Comments: The short stems of nodding green violet make this plant difficult to spot in the surrounding vegetation.